Following on from the success of Ronnie Wood: Artist, Ronnie Wood releases his latest book, The Rolling Stones Set Lists. The Rolling Stones Set Lists documents key rehearsals, recording sessions, club gigs and sell-out stadium concerts from the last two decades. These moments were captured by Ronnie in a series of hand-painted set lists, and over 100 of these set lists make up the new book. The all-new edition also includes an assortment of nearly 150 photographs from tours, and Stones memorabilia from the ‘A Bigger Bang’ tour in 2005, and the ‘No Filter’ tour in 2018. 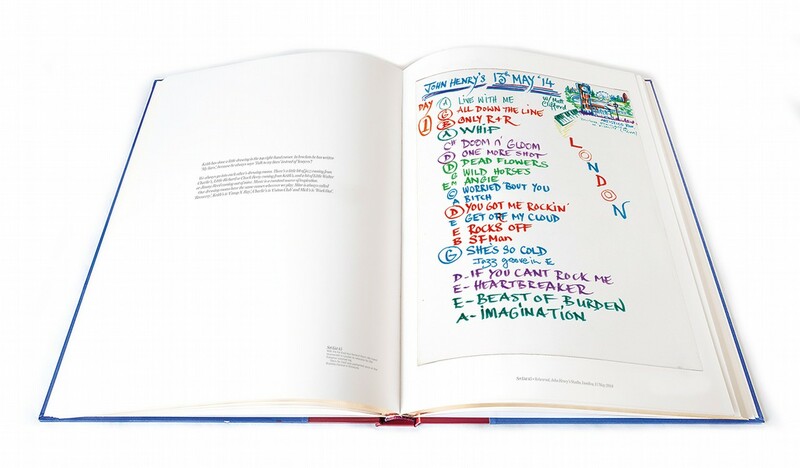 Each set list contains a unique combination of Ronnie’s artwork, lettering and notes with the occasional doodle by other Stones members. Explanatory captions examine the background and significance of certain songs and their place within the Rolling Stones’ history. Throughout the edition, Ronnie brings each set list to life with first-hand recollections and stories that paint a picture of life on the road with the Rolling Stones. Listen to Ronnie talk about The Rolling Stones Set Lists here.